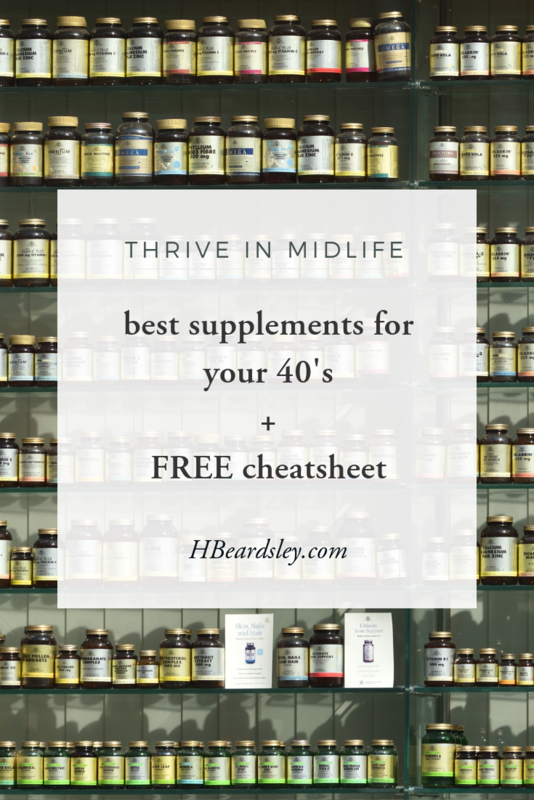 The best supplements for midlife are those that keep you healthy, provide protection from disease, help you balance hormones, help you create and burn energy efficiently, and help you stay young on a cellular level. Sometimes people ask me what I do for my skin and these two antioxidants along with my longtime yoga practice are what has made the most difference in how I look and feel. However, if you're going to take any of these recommendations, the very best supplement for your 40's is hands down Vitamin D. More on this below. Shopping links are below each recommendation. If you want to buy all the supplements in one go, it's easiest to shop the entire Amazon Recommended Supplements list HERE. Supplements do absolutely nothing for you if you never take them. This is why I take about 5 minutes every Sunday to fill up a plastic pill organizer chest to accommodate the different sizes of supplements and keep it in my kitchen, where I can easily take them after breakfast or dinner. It's the most powerful antioxidant that the body makes. It's an anti-aging powerhouse in several capacities and aids in toxin removal. It's been recently formulated in the acetylated form to remain stable and effective in the digestive tract. For this reason only use the acetylated version because without it, the body breaks it down and it becomes ineffective. Many Naturopathic Doctors have traditionally used glutathione for intravenous chelation therapy to remove heavy metals like mercury. So it's fantastic that this powerful supplement is available to use at a relatively reasonable cost compared to what chelation therapy runs. Read about glutathione here and here. ALA is an antioxidant powerhouse that, when used in combination with S-Acetyl Glutathione can really make a difference for you. ALA controls inflammation, blood sugar, and protects your skin collagen structure. Yup, you just read that right. It keeps your skin looking youthful! It also helps the other antioxidants in your body work better, is good for nerves, and also helps your body detoxify heavy metals from the body and therefore is a liver detoxifier. ALA is basically your new best friend in midlife. As we age, we make less and less ALA so this is one instance where taking ALA supplements can make a lot of sense. I like a sustained release formula for better absorption. Get your D levels checked with a'25-hydroxy test‘ or 25 (OH) blood test when you run your labs with your doctor at your yearly checkup so you know where your D level is at. Once you know where you are at you can better determine how much to take. As a rule, if I'm spending a lot of time in the sun, I skip the D. In the wintertime I take it pretty much daily. The goal is to optimize your vitamin D level to 70-90 ng/ml and monitor it on an ongoing basis to keep it there. Keeping your vitamin D level optimized between 70-90 ng/ml will protect you from disease, some types of cancer including breast cancer, depression, and helps support healthy thyroid function. Vitamin D is fat soluble so take it in the morning with a little bit of fat. (I take it in the morning with coffee which has fat in it.) It’s important to take it in the morning because it will set your internal clock ticking and cause melatonin (which makes you sleepy) to be released a set number of hours later. If you take D at night your circadian rhythm and sleep pattern can get messed up. PLEASE take charge and beware of doctors who tell you your D levels are fine. You need to always look at your labs yourself to see where you are on the range. (and always, always take a copy of your labs home with you to put into a health binder for your own reference.) Lab reference levels often range somewhere between 30-100. Levels just above 30 are only adequate to prevent disease (rickets). If your level falls anywhere below 50 you will probably be feeling symptoms of low vitamin D: head sweating, depression, achy bones &/or a feeling of weakness, and frequent colds and infections. Vitamin C is an antioxidant that fights free-radical damage from environmental pollutants. The buildup of free radicals over time is responsible for the aging process. Free radicals may also play a role in cancer, heart disease, and conditions like arthritis. Vitamin C is also necessary for proper adrenal function and is crucial for healing stressed adrenals. Stressed adrenals are no joke. If you have adrenal fatigue double your vitamin C intake. I take this for energy and to help my thyroid function. Consuming caffeine, alcohol, refined sugars, and medications like birth control pills and NSAID's deplete the body of B vitamins. Chronic stress can deplete you of your B-vitamins, too. If you are stressed or have adrenal fatigue, be sure to take your B-vitamin complex. The body cannot store B vitamins because they are water soluble, so you should take your B vitamin daily. I take a complete formula to keep it simple. Take your B in the morning so you benefit from the energy bump! Take one in the evening 1 hour before bed. If desired, take another dose in the morning. It has a full-body relaxing effect and can help with tension headaches. I also use it to minimize muscle soreness after workouts because it relaxes achy and tense muscles. Magnesium also helps you build bones, and its importance is often overlooked in this area. Magnesium helps regulate a healthy blood pressure and um, keeps you regular. This form will not give you the runs unlike other forms of magnesium! If you eat a high fat low-carb ketogenic diet, taking magnesium will help you balance your electrolytes. Take one in the morning and one 1 hour before bed. The evening dose will help relax you and get you ready to sleep. Take it in the morning, but not with calcium or iron. Zinc is found in all of our cells and is water soluble so you need a constant supply. Zinc is necessary for hormone production, increases hormone production if there is a deficiency, and helps the body release human growth hormone which helps the body heal itself, builds strength and stamina, and builds a healthy metabolism. Low zinc levels low zinc dulls your sense of taste, which often means intense cravings for salty or sweet foods. If you have an intense craving for sugar, chocolate, or salty foods, especially right after eating, you may be zinc deficient. Other signs of zinc deficiency are white spots on the fingernails and an aversion to the taste of plain water. For more on zinc read my in-depth post HERE. Zinc also helps the hormones insulin and glucose to work properly so that glucose is used for fuel and not stored as body fat, therefore zinc supplementation can help those with blood sugar, diabetes, & other metabolic issues like insulin resistance. Zinc acts as an antioxidant by fighting cellular free radical damage, which means it keeps you younger on a cellular level. It also helps optimize immune function, proper digestion, and is a powerful anti-inflammatory which is why it's so important and why you I recommend taking zinc every day preferably in the morning. Start with a liquid zinc at low 5 mg dose per day, which is 3-4 drops under the tongue with the brand I recommend. Slowly work your way up because taking too much zinc at once can make you nauseous. Continue with 5 mg/day for 3 days. Then double the dose to 10 mg/day for three more days. As long as you don't feel nauseous, keep doubling until you are at about 30 mg/day. At that point, you can try switching over to a 30 or 50mg capsule or tablet. Note: do not take zinc with calcium or iron as it can interfere with absorption. If zinc upsets your stomach, take it with food, but again, try to avoid dairy or food high in calcium. The body relies on Vitamin K to deliver calcium to the bones. K can’t be produced from your food without the action of good healthy gut bacteria, so you may be deficient if you have digestive problems like leaky gut, IBS or Chrone’s, if your diet is poor or if you’re gut flora has been compromised by antibiotics or chemotherapy. Besides Vitamin K’s bone-building benefits, K also removes calcium out of the blood which helps prevent dangerous calcium plaque deposits from forming in your arteries that can cause heart disease or a heart attack. Vitamin K is anti-inflammatory which delivers benefits like better gum health, lower blood pressure, and protects your brain against neurodegenerative diseases like Alzheimer’s and Parkinson’s disease.Because K helps get calcium where it belongs, it also reduces the amount of calcium plaque deposits that build up on your teeth. If you’re taking anticoagulant drugs, don’t take vitamin K supplements or increase your dietary intake without consulting your doctor. Taking a good probiotic with lots of different strains of bacteria helps build a healthy gut flora which helps you properly absorb the nutrients in your food. People with poor gut bacteria are at higher risk for developing depression because the gut bacteria helps communicate with the brain via the gut-brain axis.Gut microorganisms produce and deliver serotonin and gamma-aminobutyric acid to the brain which is essential for healthy brain function. Gut bacteria are also responsible for producing vitamin B12, k2, and killing off harmful bacteria.Gut bacteria helps keeps yeast and fungus from growing in your gut, and wards off urinary tract infections, too. In fact, 80% of your ENTIRE immune system is located in your gut, so investing in a healthy gut flora is important. Especially because antibiotics, sugar, refined carbohydrates, prescription medication, and chronic stress disrupts and degrades a healthy gut bacteria colonies. For these reasons we all would benefit from taking a probiotic, but if you have any digestive issues, depression, IBS, Chrone's, or chronic diarrhea or have anxiety, depression, PMS, or ADHD it is especially important to take a good quality probiotic. There are different types of strains of probiotics that deliver different benefits from immunity, digestion, fat burning, & hormonal balance. NOW Foods offers a probiotic selector quiz so that you can find a probiotic that delivers targeted benefits for a particular issue. I take a general NOW probiotic that includes 10 different bacteria strains for general gut health. 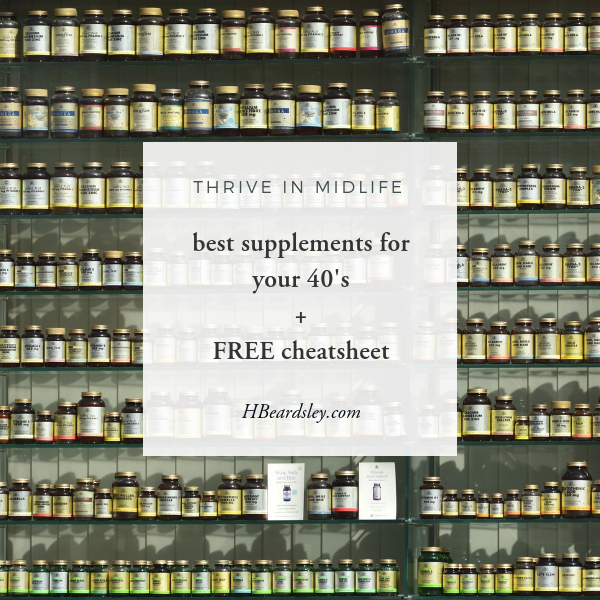 All the products I recommend from Amazon can be found on The Thrive In Midlife List – click here for convenient one-stop shopping. p.s. Beyond these core supplements, I also take a few others specifically recommended for my thyroid function and/or when I'm showing symptoms of adrenal fatigue. I would take k2 as early in the day as you are able because K2 works in tandem with your vitamin D to get calcium into your bones. The body reads a surge in vitamin D as setting your morning internal clock and energizes the body and it also sets your circadian clock ticking for the corresponding increase in melatonin that will make you sleepy 12-14 hours later. so if you take D later you will be interfering with your natural circadian rhythm.